I first learnt about the world of spinning and wool related crafts through this book, 'Winter Nature Activities for Children'. The book has a whole section for the month of January on working with wool with children. Before reading this, I had never come across hand spinning before and I was fascinated. The scope of activities to try for myself and with the children! 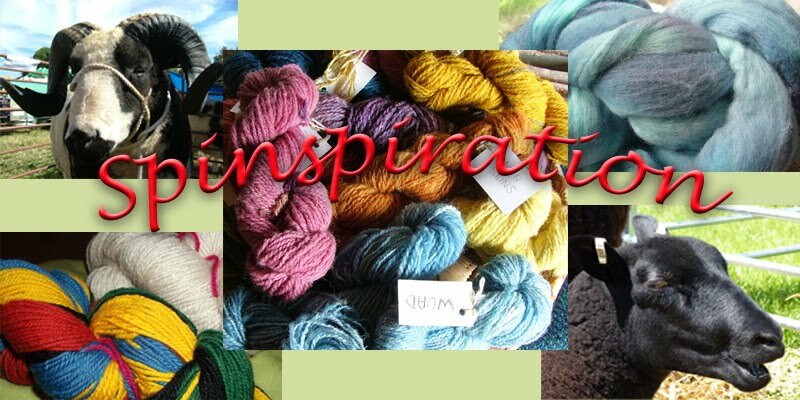 The section has a great general overview about the history of using wool for clothing, shearing sheep, cleaning carding and spinning methods and also knitting, weaving and felting. Just the quick, ininformative overview I needed to be inspired! Since I didn't have any sheep fleece or anything to spin on, we took a walk to the nearby fields and plucked up bits of sheep's wool off the grass and off the fencing. Then, having got the idea from the Winter Nature Activities book, I cut just the right branch with a smaller branch, a good 'V' shaped hook at the top, and cut it down to form a branch hook spindle. And I was off, spinning in this most basic, primitive way! It was a good introduction. Soon after that I bought a drop spindle and managed to source a big bag of organic raw fleece from a parent at our home education group whom I discovered was a spinner after chatting to anyone who would listen about my new interest! I spun solely on a drop spindle for at least six months and taught myself via books, YouTube videos and through trial and error. The following Spring, I went along to a spinning day held by our local spinning guild and met a wonderful woman there who had been spinning for over forty years. Francis was so incredibly helpful and she offered to sell me a spinning wheel and give me a spinning lesson thrown in. The introductory lesson was invaluable. It really helped me consolidate and correct my self-taught spinning techniques. The biggest tip she gave me was to practice for half an hour every day. That really helped me. 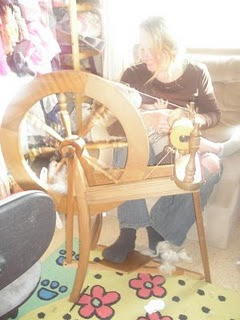 I mostly spin with raw fleece and mostly English rare breeds that I source locally here in the Cotswolds. 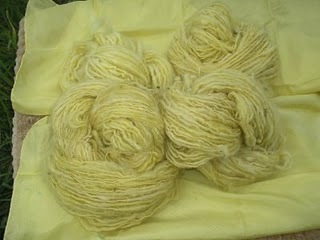 I enjoy natural dyeing using dyes I can find in the garden or around the farm. 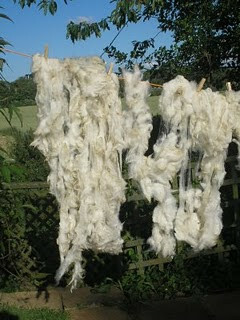 I enjoy the whole wool process from dirty fleece onwards. On occasion, I do get a bit of prepared fibres for special projects. Right now I am drop spindling rust coloured merino wool to knit up a fox for a learning block the children and I will be starting on soon. I still use the drop spindle regularly and feel it is a great place to start. It is so portable and simple. I can take it anywhere and get a little spinning done on the go. I do love my wheel though! I go through periods of spinning regularly and other times when I don't spin for weeks on end. At this stage, it is not easy for me to join in with Guild meets or go on further spinning lessons as I have four young children whom I home educate. There will be other times in the future for this. It is wonderful though, to enjoy spinning and wool related crafts as there is so much the children can be included in and so much they can learn too with working with wool. I still have much to learn and that is the attraction of any craft. There is always more to learn. Having this space to share, to support, to encourage and to learn from each other is very exciting to me. I have lots of spinning to get done to make room for Spring shearing time. Always something to look forward to! And that is my spinning story!